Devils Den, Kern County, CA. 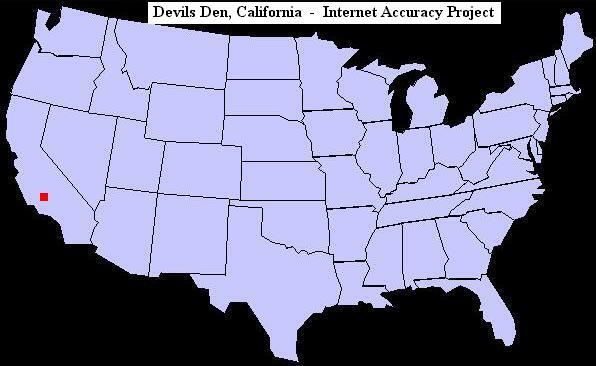 Devils Den is located in Central California, in the northwest corner of Kern County, just south of the Kings County line. The nearby Devil's Den oil field is located to the west of highway 33 and south of Devil's Den Road. According to the book, Kern County Place Names, by Curtis Darling, Devils Den, California was named for an unusual volcanic formation found four miles to the west. Time Zone: Devils Den, California is in the Pacific Time Zone. Visit our page of U.S. plant hardiness zones for a look at maps showing all hardiness zones throughout North America. Camping, fishing, hunting, picnicking, hiking, birdwatching, photography, golfing, sky diving, off-roading, kayaking, rafting, mountain biking, boating and horseback riding. Fox, bobcat, coyote, opossum, raccoon, weasel, badger, skunk, squirrel, muskrat, beaver, jackrabbit, tortoise, pheasant, falcon, duck, geese, quail, pelican, dove, owl, warbler, oriole, goldfinch, woodpecker, starling, swan, heron, egret, sandpiper, hawk and eagle. For an extensive list of other odd town names in the United States, visit our page of unusual, bizarre or humorous names of towns.